Can Chase let go of the shadows of his past in order to accept the love Tommy offers? Chase in Shadow by Amy Lane, available from Dreamspinner Press. Chase Summers: Golden boy. Beautiful girlfriend, good friends, and a promising future. Nobody knows the real Chase. Chase Summers has a razor blade to his wrist and the smell of his lover’s goodbye clinging to his skin. He has a door in his heart so frightening he’d rather die than open it, and the lies he’s used to block it shut are thinning with every forbidden touch. Chase has spent his entire life unraveling, and his decision to set his sexuality free in secret has only torn his mind apart faster. Chase has one chance for true love and salvation. He may have met Tommy Halloran in the world of gay-for-pay—where the number of lovers doesn’t matter as long as the come-shot’s good—but if he wants the healing that Tommy’s love has to offer, he’ll need the courage to leave the shadows for the sunlight. That may be too much to ask from a man who’s spent his entire life hiding his true self. Chase knows all too well that the only things thriving in a heart’s darkness are the bitter personal demons that love to watch us bleed. Will Rafi convince James to believe in happy-ever-after? It’s Not Shakespeare by Amy Lane, available from Dreamspinner Press. College professor James Richards is in a rut and feeling his age. He moved to northern California to escape heartbreak and humiliation, but so far the only good thing to happen to him has been his Boston terrier, Marlowe. Then James’s toughest student sets him up with her best friend. Rafael Ochoa is worlds apart from James—chronologically, culturally, and philosophically—but he’s also beautiful, kind, and a shot of adrenaline to James’s not-quite-middle-aged heart. Together, the two of them forge a bridge between James’s East Coast sensibilities and Rafael’s West Coast casualness, but can their meeting of the hearts survive James’s lack of faith in happy-ever-after? Will Talker and Brian finally get their happily-ever-after? 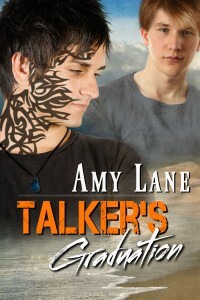 Talker’s Graduation by Amy Lane, now available from Dreamspinner Press. When you get past the basics of survival, what next? Brian Cooper recovered from the attack that almost killed him, and Tate Walker faced down his own demons. Now all that’s left is… each other. Growing up together and growing into their love is everything but easy. Talker’s eternal optimism and Brian’s quiet faith just might be able to conquer the obstacles, big and small, in their way—as well as overcome the complications of having all their dreams come true. Can “Whiskey” help Patrick get his life back together? Clear Water by Amy Lane, available from Dreamspinner Press. Meet Patrick Cleary: party boy, loser, and spaz. Patrick’s been trying desperately to transform himself, and the results have been so spectacular, they’ve almost killed him. Meet Wes “Whiskey” Keenan: he’s a field biologist wondering if it’s time to settle down. When the worst day of Patrick’s life ends with Whiskey saving it, Patrick and Whiskey find themselves sharing company and an impossibly small berth on the world’s tackiest houseboat.